The Bar-winged Weaver was formally described by Jose Vicente Barbosa du Bocage, a Portuguese zoologist and politician. He was curator of the Lisbon Museum, and described several other weavers. 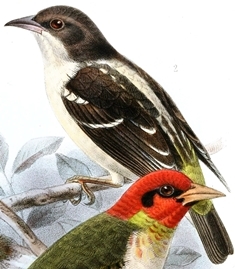 The Bar-winged Weaver was collected by Jose Alberto de Oliveira Anchieta, a Portuguese explorer and naturalist, who collected a large number of birds in Angola. In 1867 the Portuguese government hired Anchieta as a naturalist but probably also as a secret agent and informer in the Caconda region of Angola. Anchieta lived in Caconda, explored the area and sent many specimens and letters to his scientific correspondents in Lisbon. Anchieta discovered the Bar-winged Weaver near Caconda, and sent a specimen to the Lisbon Museum. 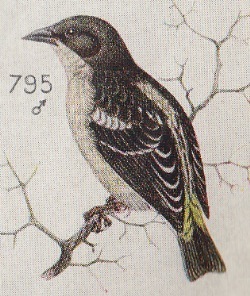 The first illustration of the Bar-winged Weaver was published in Shelley (1887). The second illustration was published decades later, by Mclachlan & Liversidge (1957). Sharpia angolensis	Bocage 1878	Jorn. Sci. Math. Phys. Nat. Lisboa, 6, p.258	Caconda, Angola. angolensis, After Angola (Mbundu native name ngola, title of the rulers of the kingdom of Ndongo). Sharpe's Weaver Bird (Layard 1884).